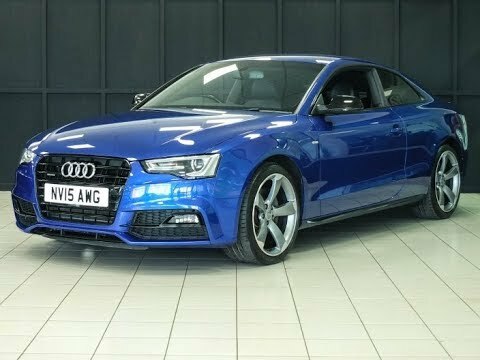 This Audi A5 3.0 TDI 245 Quattro Black Ed Plus 2dr S Tronic is loaded with specification which is what you would expect being the top of the range diesel model. In our opinion Sepang Blue is the best colour avaliable and this car looks truly fantastic with 19 inch alloy wheels. This car boasts specification including heated front seats, full leather interior, HDD entertainment, bluetooth streaming, satellite naviation plus, Audi music interface and much more! This car boasts full service history having had 5 services since new with Lawson Cars at the following intervals: 21/01/16 @ 12491 miles, 27/09/2016 @ 24754 miles, 17/03/2017 @ 34267 miles which also included a gearbox service, 28/11/2017 @ 46579 miles and 30/08/2018 @ 58550 miles. This car had recently undergone an MOT test advisory free and will be sold complete with three months warranty. Depending on the terms, conditions, general exclusions and claim limits shown in this document, the Gold Cover Guarantee will cover the cost of repairing or replacing any of the parts of your vehicle that are listed below where that part has failed as a result of sudden and unexpected mechanical or electrical fault. Wear and tear items are not covered. Braking system – Brake master cylinder, calipers, wheel cylinders, brake bias and restriction valve, vacuum servo, brake vacuum pump, ABS wheel sensors, ABS pump, ABS module. Clutch – Clutch, master cylinder, slave cylinder, clutch fork. (Replacing any part due to wear and tear is not covered). Cooling system – Radiator, oil cooler, heater matrix, thermostat, thermostat housing, water pump, viscous fan coupling, cooling fan and engine temperature sensor. Electrical system – Alternator, starter motor, ignition coil, relays, electronic ignition module and distributor, cooling-fan motor, temperature sensors, oil-pressure sensors, fuel-tank sender unit, electric-window motors and switches, central locking systems (not wiring), wiper motors and switches, washer motor and pumps, headlight motors, multi switches, instruments, brake-light switch, reversing-light switch, heater resister, heater motor, horn, ECUs and airbag system (not wiring). Engine management – Knock sensor, MAP sensor, airflow meter, camshaft sensor, crank sensor, oxygen sensor and TDC sensor. Engine – Cylinder block, crankshaft, crank bearings, big-end bearings, oil pump, connecting rods, gudgeon pins, small-end bearings, pistons, piston rings, cylinder head, cylinder head gasket, rocker assembly, camshaft and camshaft followers, push rods, camshaft bearings, inlet and exhaust valves, valve springs, valve guides, inlet and exhaust manifolds, timing gears, timing chains, timing belts, tensioners, flywheel, auto drive late and starter ring gear. Final drive – Differential assembly, drive shafts including CV joints, prop shafts, universal joints and couplings, driveshaft bearings, wheel bearings and hubs. Fuel system – Injectors, fuel pumps, fuel pressure regulator, auxiliary air valve, idle speed control valve, stepper motor, power valves, EGR valve and throttle body. Steering – Steering rack and pinion, steering box, steering column, power-steering motor and power-steering pump. Suspension – Coil springs, ball joints, shock absorbers, hydrolastic displacer units, hydro-pneumatic suspensions, accumulator sphere, control valve, suspension spheres and high-pressure pump. Transmission – All parts within the transmission casings and transfer box. For details on how to extend your Gold Cover Guarantee please contact a member of our sales team. Note 1: Diagnostic costs are paid as standard (on covered components only). Note 2: If a part needs repairing or replacing and it is not listed, it is not covered. Note 3: Individual claim limit - £1,000. Aggregate claim limit – Price paid for the vehicle. Welcome to Lawson Cars . To optimise your experience, cookie settings on the website are set to allow all cookies. By continuing your journey throughout the website, you consent to this. You can change these settings here. Lawson Cars are authorised and regulated by the Financial Conduct Authority under reference number 650145. Finance Subject to status. Other offers may be available but cannot be used in conjunction with this offer. We work with a number of carefully selected credit providers who may be able to offer you finance for your purchase. We are only able to offer finance products from these providers.